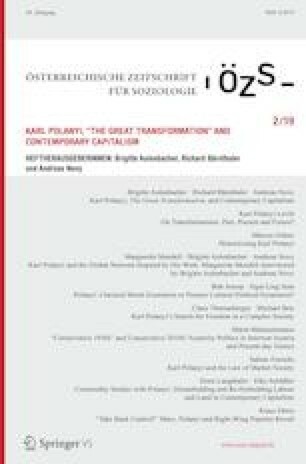 The work of the Hungarian economic historian Karl Polanyi is experiencing growing attention within social sciences, inspiring scholars from different disciplines like history, political science, sociology and economics. Especially his prominent institutionalist account on the rise and fall of the market society in the 19th century and the first third of the 20th century, exposed in his seminal book “The Great Transformation” (Polanyi 2001), is under close review. A work which is believed to provide valuable insights for the understanding of contemporary neoliberal social change (e. g. Block and Somers 2014) and economic crises (e. g. Seccareccia and Correa 2017).